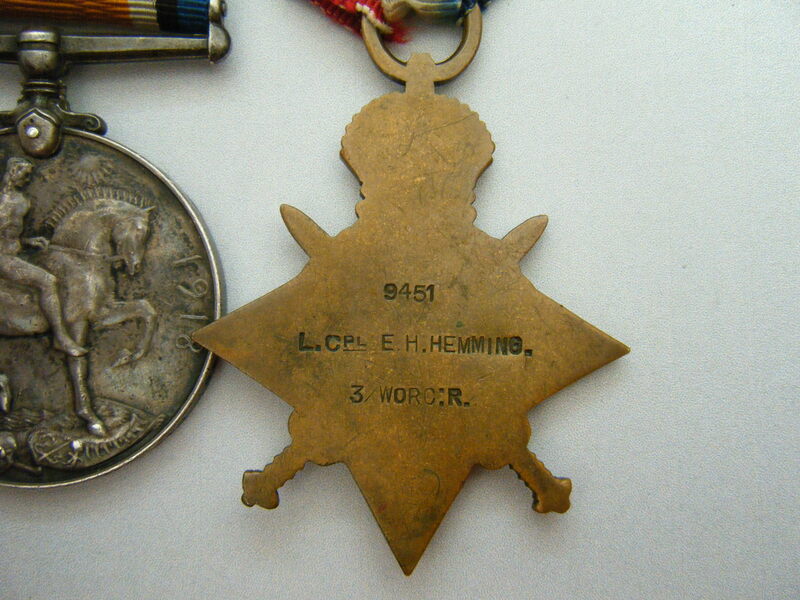 WW1 1914 Mons Star medal group awarded to Corporal (later Private), 9451 (later 13899), Edward H. Hemming, Worcestershire Regiment (later the Warwickshire Regiment). 1914 Star (with Mons clasp) named to 9451. LCPL. E. H. HEMMING., 3/WORC. 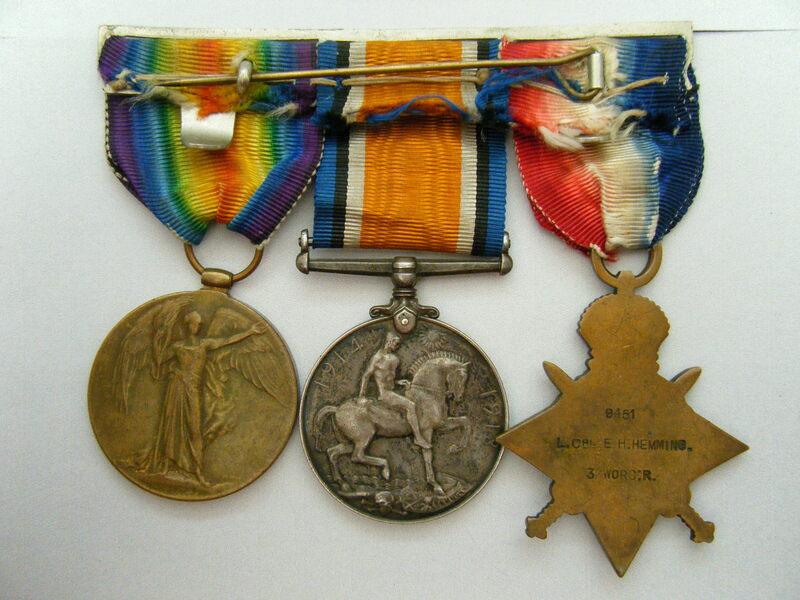 R.
British War Medal and Victory Medal named to 9451. PTE. E. H. HEMMINGS. WORC. 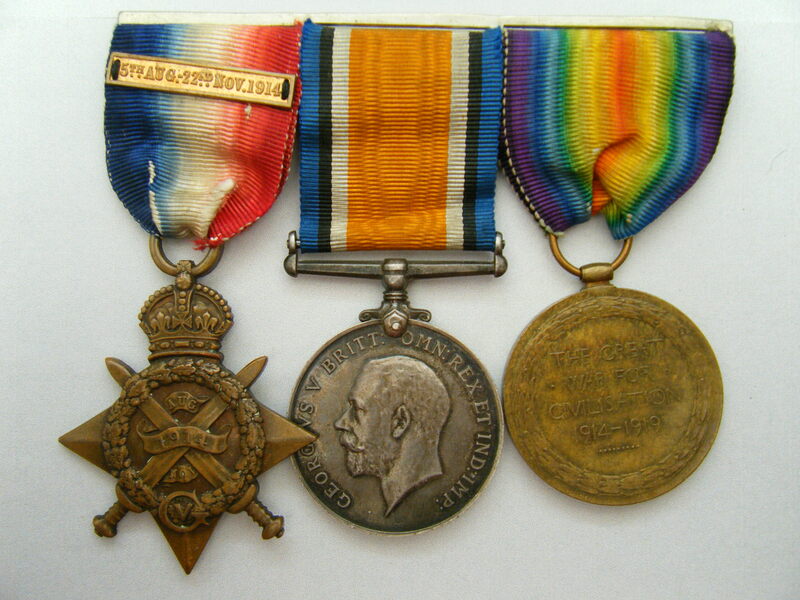 R.
NOTE1: It should be noticed that the surname is spelt slightly differently on the 1914 Mons Star to that on the other two medals. There are two separate Medal Index Cards to this man, both with identical service numbers and regiments one named to Hemming (no S) confirming the 1914 Mons Star award (with clasp and roses) which can viewed by clicking on here (if you have access to Ancestry). The second confirming the British War Medal and Victory Medal but named to Hemmings which can be viewed by clicking on here (again if you have access to Ancestry). Given the same regiments and the same service numbers, this is undoubtedly the same man. It is not uncommon to find different spellings to the same man on different MIC’s. I have been unable to identify any service records relating to this man using either spelling. The medals come swing mounted on a contemporary medal bar with original ribbons and with paper copies of both Medal Index Cards. Hemming served in the 3rd Battalion Worcestershire Regiment, which received its orders to mobilise on 4th August 1914. The order for mobilisation was received, at Tidworth and the unit moved to Southampton on the 13th August, before sailing to France the following day on the S.S. Bosnian and debarking at La Havre on the 15th August to form a part of art of the 7th Brigade in the 3rd (Iron) Division. An account of the Worcestershire Regiment can be viewed by clicking on here, a very detailed account of the 3rd Battalion - particularly its activities in France can be viewed by clicking on here. Activities associated with the 3rd (Iron) Division can be viewed by clicking on here. This account gives a detailed order of battle that includes the 3rd Battalion Worcestershire Regiment - although it should be noted that the 3rd Battalion Worcestershire Regiment transferred onto further Divisions after October 1915. Hemming himself arrived in France, (according to his Medal Index Card), on the 2nd November 1914. I’m unable to say when he changed regiments, and I cannot account for why it would appear that he was demoted to Private after 1914. At some point he was transferred to the Warwickshire Regiment. The Warwickshire Regiments activities in France can be viewed by clicking on here. Depending on when Hemming joined this unit, and which Battalion he served in means that he could have been present at Gallipoli in 1915.